LANZAROTE SUMMER CHALLENGE 2016 is The combination of aquatic challenges in a natural environment, Crossfit and the summerlike party atmosphere makes this event an incomparable attraction for all sports lovers. 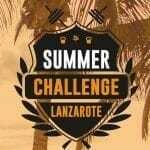 The Lanzarote Summer Challenge 2016 participants will be selected by an online qualifier system. – RX’s masculine and femenine (+17 años). – SCALE masculine and femenine (+17 años). – MASTER masculine and femenine (+36 años). – TEAM (2 boys and 2 girls). The workouts will be released on May 15 at 9 am. Athletes will have until May 30 at 10 pm canarian time to submit their scores and videos, being this also the last day for registration. Qualified athletes will be announced June 2.